This full moon is like a blast of winter in the middle of the summer. With Mars stationing retrograde in chilly, Saturn-ruled Aquarius yesterday, many have the feeling of frustration that comes from being frozen, feeling stuck, not being able to move freely. The full moon late tonight is right on top of Saturn in Capricorn. This is, effectively, a meeting with him to follow up on what's been happening since he entered Capricorn in December. Yes, Saturn schedules meetings, and he takes attendance, too. The moon wants to know how you feel about your limitations. Saturn wants to know what you're doing with them. Whether you're experiencing restriction in relationships, work, money, creativity, or somewhere else, this is a moon for pushing through. Or at least figuring out your plan. Mars retrograde in Aquarius has us reflecting on what we want, and Saturn is going to make us work for it. As I have mentioned before, Saturn transits are excellent for manifestation: not the fluffy kind often associated with law-of-attraction style magic. Attraction by itself is more of a Jupiter-Venus thing. Saturnian manifestation is the authoritative kind. The I will it to be so kind, and usually the kind that is achieved with more than a little sweat. It's a good time to review the meaning of Saturn's transit through Capricorn. Pragmatism. Ambition. Structure. Authority. Work. These are the keywords of this full moon. As we head into eclipse season and slow down on action through Mars Retrograde this summer, it will be important to maintain boundaries and structure. Stay focused on your goals. As long as you're doing the work, Saturn will help you get there. Announcing 3 free astrology webinars with my favorite teaching duo! I'm so excited to tell you all about this free live training on working with the energy of Saturn! If you’re currently between the ages of 27-30, or 57-60, you are smack dab in your Saturn Return. Which means the very foundation and structure of your life is getting a shake up! Great news: two of my favorite healers, Sandy Sitron (NYC-based astrologer) and Dana Balicki (Joshua Tree-based Transformational Coach), are offering a free live webinar to support you in navigating these big, sometimes core-rocking, life shifts. The shadow of your Saturn Return can last into your early 30’s (or 60's if you're on your second). To make Saturn’s impact on your life even more profound, every 7 years or so you reach a mini-checkpoint (around the ages of 7, 15, 22, 29, 37, 44, 51 etc...)! At these sensitive ages, Saturn, the authoritarian, calls on you to steady your foundation. All ages welcome! Simple tools to keep your change alive, conscious and thriving no matter what! 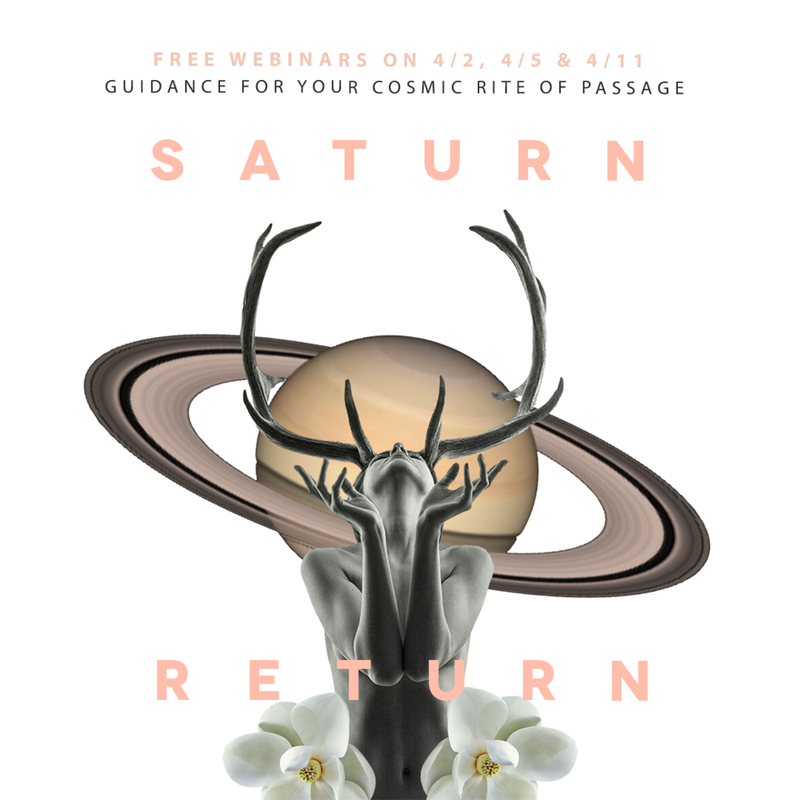 Register for April 2nd to get a one-time only discount on their Saturn Return Workshop! I'm a proud affiliate partner of Sandy and Dana’s Saturn Return Workshop because I believe in the work they’re doing -- and I know they do it well! I earn an advertising fee by linking to their program. Our Capricorn-laden January continues with a new moon in this sign, conjunct Venus and square Uranus in Aries. Saturn, the ruler of this moon, is conjunct Mercury and Lilith. With the sun and Pluto occupying this sign as well, it’s a crowded place. We’re feeling more Capricorn energy than usual as we begin 2018. It’s a strong energy: high-achieving and wise. Capricorns don’t get enough credit for their creativity and spiritual wisdom. Too often, Cap is represented by a Suit in an office, concerned exclusively with material success. But the list of famous Capricorns includes Patti Smith, David Bowie, J.R.R. Tolkien, Matisse, and Cezanne. The symbol for Capricorn isn’t a mountain goat. It’s a mythical animal called the sea-goat, half goat and half fish. While the front half of Capricorn is on solid land, making practical decisions to get ahead in life, the back half is swimming, dreaming, imagining and feeling. And those dreams become real. Because where there is water and earth, there is an extraordinary power to manifest. Saturnine discipline makes dreams come true. This association probably contributed to the labeling of Saturn as a malefic. Historically in western culture, witches have been feared for their power. Capricorn is the sign of authority, and working magic puts one in a position of authority, manipulating the energy of the universe to manifest one’s will. In this era of late stage capitalism and scientific materialism, we tend to think of “authority” as synonymous with business and government, hence the depiction of Capricorn as a paragon of material success. But there is so much more to Cap than that. With a large stellium in Capricorn that includes Saturn, Lilith, and Pluto, this is a moon for creating. If January is when you want to start your new year, make your resolutions tonight. Set the intentions, do the ritual, or work the spell in the first three days following this moon. Be careful about the promises you make and the things you ask for. Saturn will hold you accountable. It’s the correlation of Capricorn and Saturn with achievement and reality that makes this potent. When Saturn says “so mote it be,” it must be. It’s worth remembering at the Capricorn moon cycles. Use the wisdom and power of this sign to your advantage tonight. You can read more about which resolutions and intentions will be most powerful for you in the horoscopes for this week.